WELCOME TO MY HOME… DID YOU SEE MY ENTRY DOOR? Brock Doors & Windows Ltd. WELCOME TO MY HOME… DID YOU SEE MY ENTRY DOOR? WELCOME TO MY HOME… DID YOU SEE MY ENTRY DOOR? Sheer panic. There’s no other way to describe what a “drop-in” from my parents does to me. Panic. I quickly assessed my house and knew what I had to do: I needed to shove everything strewn about into closets immediately. I’m sure you can relate? Toys were flying across the room and into bins. Shoes were shoved into the front closet by the armfuls. My dog ran to hide under the table while I shut doors, kicked books under the couch, and overfilled the dishwasher with dishes that had been sitting in the sink… I was in full-on power-clean mode. The thing is, it wouldn’t matter. My parents know me; I’m not fooling anyone. Here’s the twist in this little story: they actually did not notice my haphazard, cluttered home. In fact, they took nearly 15 minutes to move from my entryway and foyer into the living room. Why? Well, I had replaced my entry door (as I originally expected my mom to inquire about)—and they were dazzled. Two weeks prior, I’d visited Brock Doors and Windows on referral from a coworker. You see, I threw a birthday party for my daughter and my mom—ever so graciously—pointed out how “uncomely” my front door had become: “Darling, you’re in your thirties. This entry door looks like the entrance to a cheap hotel.” Lovely, Mom; lovely. She was right, though. My entry door had taken a beating and was far past its prime. The hardware was ugly, there were dents and scuffs all along the bottom (I love my children, but they were destructive when they were littler), and the frame seemed to have begun to warp. It was old and I don’t believe it was very high quality when the previous owners selected it, anyway. So, as I stood outside to greet my parents upon their unplanned arrival, I felt pride wash over me. They fawned over my new entry door from Brock—especially my mom. Even though she “wouldn’t have chosen slate” as her front door colour, she loved it. My dad hunched over to touch the hinges and assess the door weight and safety locks in approval. For no less than 15 minutes we stood there while they asked questions about the installation process, the hardware I’d selected, the new sidelite windows flanked to the left, and the material choices I made. They were proud and they were inspired. And I was a little girl again, thrilled to show off my work to my mom and dad. Is your entry door old and beat up? 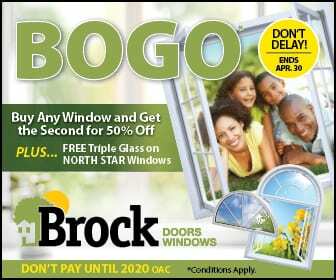 Give Brock Doors and Windows a call. You deserve to be excited about your home again, too, and the pros at Brock can make that happen!